Michael: Welcome back to the show. I'm here with Elishia Dvorak from Adobe and she is the technical marketing manager for cold fusion and in charge of C.F. summit and we're going to talk today everything about C.F. summit that you need to know. And we're going to look at what exactly C.F. summit is and why it is so important to the cold fusion community. 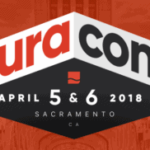 Why every cold fusion developer should be going to this and we’ll also look at the technical details of when it is, where it is, how much it costs, special discounts. We’ll look at what's new this year and we’ll be revealing for the first time the speakers and topics of just being announced real soon now that Elishia is excited about. And also a little sneak peek info on the special event this year. So, welcome Elishia. Elishia: Here are my goal. So, cold fusion summit is number one is the largest Adobe developer focused conference. So, it is about five hundred attendees typically. And what makes it really unique is that Adobe puts it on for our cold fusion community. So for us, it's really not only an engagement platform but it's a gift to the community and we put a lot of work into this. A lot of budget goes into this so, we hope everybody comes and enjoys themselves. Michael: Wow! And why is it so important to the cold fusion community that we have C.F. summit? Elishia: Well, I think the main thing is it really is the cold fusion community an avenues to network in person. Where they don't get that at a lot of other developer conferences where they're not really focused at all on the cold fusion technology. But this is really cold fusion centric. It's got a lot of cold fusion specific features and functionality that will be represented. But also you know, concepts and things that the developers would be interested in that are related. So, we might have some database content as well as other content. And it’s been all around great avenues to just find out what's happening with the product and what's new with the product and where we're headed in what direction. Michael: That sounds like it's an important thing to have and it helps keep the cold fusion community more alive than it would be if it didn't exist. So I really appreciate you and everyone else Adobe putting this together. So, if someone listening is thinking, why should I go? What would you tell them? Elishia: I would tell them it's definitely probably the both learning that you'll do that in a from a developer perspective especially a cold fusion developer perspective in the few days time. So I think as far as the learning impact is very high. And the other thing is its relevance. If your company has technology, even different technologies in the stack with cold fusion. You'll learn about all of the new things that are happening in that space as well. And it's the largest event that Adobe actually attends as well. So if you have any questions about the product or what direction is headed in, we'll have all of the executive leadership represented as well as the product team and the engineering resources too. It’s the great overall place to come and gain more knowledge, network with your peers and it's very inexpensive too for the number of days that it is and all that’s involved in that conference. Michael: How many days is it this year? Elishia: It’s a two day conference. So, I guess we can get it to the window of it; that is November sixteenth and seventeenth. So, we have both days allocated. There will be forty sections in total including two general sessions as well. So, a lot of content will be distributed throughout those two days. And then we also have an additional day of preconference which is November fifteenth and that's on a Wednesday and that'll be before the conference which has a full day of lab and you'll have your pick of a couple of different topics. But each of these topics is a full day hands on workshop where you're actually going to take that content and walk through it with the instructor. Those topics that are already been announced as well. We're going to have one topic for preconference lab on security and then we also have a couple other ones. One is on N.B.C. and development language aspect and the third one is going to be an A.P.I. centric you know, Lab. So, you have a lot of different choices for preconference labs as well as the main conference learning too. Michael: And are there a lot of people from Adobe there, from the cold fusion team that you can talk and meet with or? Elishia: Absolutely so, there's going to be probably like I said this is the largest gathering of all of the adobe folks from the cold fusion side and I believe this year we're going to have more by they’ll be resources there than ever before. So, we're going to have additional resources from our Q E team, our Q E management. So, I think that if there was any year to attend, if you want to have a conversation the engineering. We will have a lot of folks there to answer any questions you have and talk about how they implemented these features and functionality as a product. So, it's kind of a cool gathering of Adobe folks who if you want to talk with us about anything. Michael: And also, a lot about the cold fusion developers great opportunities, network with other people, maybe meet people you’ve met on the C.F. slack channel or Twitter and meet them in person. Elishia: Absolutely yes, you will meet the famous Twitter folks, you meet the famous flat panel participants. Usually, they're all there and we only have you know, the biggest community members that are more active in the community. Those folks usually end up having a session or two. So for example I know Charlie 06:56 [inaudible] going to be there and he's going to do a session on some cold fusion features that and [inaudible] is going to be there. So, we have all of the really main people that are participants in our community that will also be there and you can talk with them. The other thing I would mention as part of that you know, the little bit that you said about the attendees is I would say about sixty to seventy percent of them are developers. So, you get to talk to developers that are creating applications and network with them and find out how they're actually implementing things. And I think that's one of the things that folks have told me that they really appreciate about this conference is not only from the developer side, but the other side which are the managers and decision makers. You guys get a chance to come together and network with each other and find out how you're doing implementations, what technology facts are being used most frequently, how to solve different problems that you've seen with development. And where development is going in the future and how to set yourself up for success in the next couple of years and where that headed. So, it's a lot of information sharing between attendees that's happening and a lot of information sharing between the speakers and the Adobe representatives there as well. Michael: And where is the event happening this year? Elishia: Well, that's what I'm really excited about. So, we're going to be in a completely new venue. It’s the Mirage Hotel and Casino in Las Vegas. And the reason why I'm really excited about this place is number one, I think with most of the places that we've been to, one of the biggest complaints is the fact that these casinos are extremely large in Vegas. And a lot of people if you forget your backpack or whatever it is that you wanted to bring from your room down for the event, it'll take you five or ten minutes to get to that room. So it was the Mirage and you know, I checked it out. I did the walk and it takes about two minutes tops. You know from the elevator you're right outside the elevator and you head into the venue space. So it's not going to be a heavy walk, you don't have to walk through the casino to get there and it's a beautiful venue that’s kind of tropical and it's got nice pools outside. So, I think there's going to be a lot for everybody to do even just in the casino itself. Michael: And of course if you want to visit the casino it’s still there. Elishia: It is yes, depends on what you like to do. Michael: And is the miragethe one that has the big water fountain outside or I’m like confusing that with something else. Elishia: No, mirage is kind of a tropical thing casino and they have on the outside, in the pool area they have a really tropical cool setting. Those is pretty nice. It's really nicely done. They also have some exhibits with wildlife. So they have a believe a dolphin exhibit and they also have a view out in the back as well which has I think the tigers and things like that. Michael: Oh my! Okay, so I guess the question in my mind now is, how much is that cost to go? Elishia: So, right now it's still on early birds. So, the full conference pass is three forty nine and it will be an additional one thirty for the preconference if you want to do the full day of the conference lab. We also just have given just gave out an announced rate pass as well and I can give you guys the code here. It’s announced twenty seventeen and that'll give you the announced rate pass of two forty nine for the full conference. So, it’s a great deal. You wouldn’t get a deal like this at any other conference. I'm sure of it. Michael: No, that's a great deal especially for a conference in Las Vegas because I know it costs a nominee at least three likes to put on a conference in Las Vegas. So, I'm imagining there's a bit of a subsidy provided by Adobe on the pricing. Elishia: It is but like I said, this is our gift to the community. We do spend quite a lot of budget on this and we subsidize the pricing. And we do that because we really want the community members to have an avenue to attend this conference.We've heard just great feedback from everybody that’s attended regarding their encounters with other people. It's a really positive event. There’s a lot of learning and it just really energizes the community and so we try to give back to the community in that way and that's our way to do that. You know, we could spend the money on LinkedIn advertising or something like that but we really do want to provide an impact to the developers that are working with our product on a daily basis. And we find that this is kind of the most impactful and greatest form that we can provide that money. Michael: Well, I certainly appreciate Adobe putting this together and making it a really great event and making it affordable.And is it expensive to fly to Last Vegas or? Elishia: No, actually that's the reason why we chose that particular area is we were looking at a lot of different events that were already happening on the East Coast. So, we knew we wanted to have something on the West Coast. But also to we wanted it to be easy to get to from most places in the state. And as you know I think the flight to Las Vegas somehow happened to be less than most buying most other places in the state. So, that was one of the thing that drew us to that place. So, most of our… I would say most of our attendees are kind of coming in from the West Coast but we do have quite a lot of attendees coming in from the East Coast as well and just seems to be easy to get to from anywhere you are. Michael: I imagine the casinos have something to do with that. Michael: And I also know Southwest runs a lot of flights to Las Vegas so, that's always an economical way to fly there. If nothing else is good. So, are there any other discounts for government employees or any other things we should know about? Elishia: Yes absolutely,so we do have a government discount code. We also have a group discount code. So, if you want to bring three people or more from your team please, e-mail us at the CS summit@Adobe.com and we'll go ahead and send you those codes so you can register your group at a lower rate. Michael: Wow great! So C.F. summit's been going for quite a while now is. How many years exactly is it now? Elishia: This will be our fifth year Michael and I'm proud to say that I've been a part of every one of those. It’s been I would say a learning experience going through each of these 14:48 [inaudible] the conference. You know I remember the first one and I had to take… I would say I think I took about two, twoand a half days of scouting different hotels and I hadn't seen most of those casinos and the hotel from inside before. I think my feet were about to fall off by the third day. Walking through those casinos I think it's amazing. I think I had a fit at that time and I was getting my somewhere up as it was around thirty thousand steps a day. So, it was getting a bit crazy for me. But it was a lot to see. There was a lot to decide on, right. And there's a lot of moving parts when you put these events on as you well know So, I think we've gotten pretty good by now and so you could take advantage of that this year I would say. Michael: Well that's great yeah, I was involved with C.F. United for I think was eleven years in the end and it's a lot of work putting on one of these events. So hats off to you for doing this five years in a row. Elishia: Thank you, well also to 16:02 [inaudible] is the hero of all of the events. So I think you guys can thank him and he's got his team of champions as well that are kind of running this with us. But it's been extremely great to be part of all of these leading up to this too. Michael: Great! So, what's new this year? Elishia: We've got a lot that’s new. Aside from the venue, I think one of the things I'm really excited about is the content. So we've got a few things that I am really excited about. Some of the things that I know that everybody wants to see. I know I already mentioned that Charlie Earhart’s going to be doing some cold fusion 2016 stuff. But he's going to be doing a little bit different than the hidden gems this year. So, I'm excited to see that and how that comes out to be. He's going to be doing what's new inCF ten, eleven and 2016. So, he's probably got a lot of gems within that that he'll go over but that's always a great talk. The other thing that I'm kind of excited about is Brian Klout. He's going to talk about the Amazon Web Services. So, he'll get into things like you know, scaling with Amazon and you talk about S three and Micro services with AWF Lander so, that's exciting to me too. We also have a number of actual engineering topics that look really good. So they're going to have you know, the engineers are going to have all of that deeper information on how they still function,how you how they built features. So they're going to be a lot of doing a couple of sessions on some of the stuff that they're actually developing right now as we speak which is going to be 17:58 [inaudible] 2018 and I have been. I'm a sight yet but you know, I think those are going to be real crowd pleasers, So, I'm hoping that they work out really well. Couple of other ones that I'm kind of excited about or know on [inaudible] presentation. He's going to be doing a presentation on angular JS in cold fusion. So I think that's going to be really exciting because noone’s definitely takes a different approach. He usually kind of builds up on beginner level to intermediate. So you're not lost in his talk and so I think that's why peopleare kind of drawn to his talk. But there's a lot of, lot of topics that I think are going to be really interesting and I have a feeling that people might be complaining this year about there being too many choices that are too good for them to choose from. So I hope that happens.Sorry that they couldn't see all of them. Michael: Way indeed and have multiple tracks and how many other? Elishia: So we're going to have four tracks this year and like I said there's going to be forty different sessions as part of those. So, I believe we have about nine or ten sessions that are just from Adobe either on our own technology with C.F. 2016 or even what's coming in 2018 like I said. All of that will be brand new stuff and I think we've got some surprises for you as well so, that will be fun. Michael: Wow! It's really a lot of things going on and then I heard the special event that's exciting this year. Can you tell us anything about that? Elishia: Absolutely so, I think anybody that has been to any of our past events would know that the evening event is you know, it's like it's a culmination of the first day. Everybody's excited, they've spent the whole day learning and it's time to unwind and network with your peers. So, we put on usually a cocktail hour in the evening right after the last session of the day and we provide appetizers and drinks and we're going to do that again this year. It'll be within the casino so, it's just outside of where our event is happening. But it's kind of a cool little atmosphere because you get a view of the casino and what's happening. It'll be Thursday night for the price of a lot of people around and then we'll have our own space within because we're taking over this entire restaurant that they have. And you know we're going to serve up drinks and advertise for everybody to have a good time for a few hours. Michael: That sounds great place to network and relax after the learning you've had on the first day. Elishia: Yes and I noticed last year we actually had a band playing which was quite loud. So, I just want to let everybody know that we're not having a band this year. We're going to have ambient music playing on the speaker. But it will not be too loud this year. Michael: Okay, well that's probably a good thing because people do want to be able to talk without losing their voice which is always a risk at these events. So I'm just curious Elishia. Is there anything else people can do in Las Vegas while they’re, if they made a weekend for example? Elishia: Absolutely Michael and so we actually have a number of people that have already indicated; even in the speaker level that are indicating they're going to be staying over either Friday night and Saturday night too. So you can make a weekend of it. A lot of times people bring their family members or spouses out and they'll just stay a couple of extra days and make a whole weekend of it. So, there's a ton of things to do. I mean obviously if you like gambling, they've got the four casinos there and you know there's a ton of other casinos around. But there's also all those shows too. So, I don't know if you’ve been to some of the shows but I typically in the first couple of years we actually went to quite a few of the 22:14 [inaudible] Show. Those were pretty amazing. 22:17 [inaudible] The Blue Man Group and they got plenty of different concert venue choices too. So, there's always excitement in Vegas and things to do outside of that too and you'll have plenty of time to do that too because that's one of the reasons we have the evening event a little bit earlier in the evening. So that you can have the rest that evening to go ahead and enjoy yourself in Vegas. Michael: Oh! That’s a good idea and suddenly I've seen some amazing shows in Las Vegas over the years they just go quite over the top sometimes in a good way. And then there's a lot of famous performance. I think Shear has performed there for years and probably bunch of other people I'm not remembering the names of. And then the other thing I know when I've been in Las Vegas just wandering around some of these casinos like Paris or 23:11 [inaudible] or Venetian they're like… You know it's quite amazing. Elishia: Yeah, I know. So the Venetian is pretty cool you mention that one. I know they've got a gondola there and you mention23:23 [inaudible] They have that light show that’s outside with the fountain. So, there's a ton of different things that aren't even… you just see them while you're walking down the street and those are pretty cool too. But I think one of my favorites was definitely in the one of the… I think23:40 [inaudible] has a O’ show by the way and that was pretty amazing. Like a water acrobat show. So that was cool. Michael: It was lots of places to eat in Las Vegas too and often the casinos it's really economical to eat an amazing meal. Elishia: Yes and I think that's one thing that the Mirage has over some of the others that we've been to is there are both high end and lower end options. So, if you just wanted to grab a quick lunch and you didn't want to you know, make a reservation at some swanky place, you can grab that right there within the Mirage. They've got a lot of different options for that. But I think the food for me Michel is my downfall because I'll end up going to trying all the different restaurants and I come back I feel heavier. Yeah, they've certainly got… The food is too good there. Michael: Yes, so anything else you want to share about C.F. summit before we switch to a related topic? Elishia: I’ll say just check out the website. It'sCFsummit.Adobe event.com and take a look at it, if you have any questions about it please, feel free to e-mail us at CF summit@Adobe.com and we'll answer any questions you have. But you should definitely try to make it out there. It's a really great event that you don't want to miss. Michael: And out of curiosity of the people who went to previous years, how many of them would recommend going again? Elishia: I think that number is around ninety four percent. So it may have something like I said, we've got a lot of positive feedback and people do want to come back. I think most of the time it just comes down to budget typically for people. But if you need any help trying to negotiate that with your business unit, let me know if you need any extra information for us on what's going to be presented there, the type of content or anything else that we can do to help you get over there. Michael: Great! So, let's switch gears here and I'm kind of curious, why are you proud to be involved in cold fusion because you've been involved with it for years now. 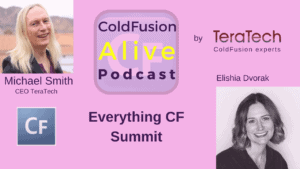 Elishia: I have been so, I’ve been involved with cold fusion for a number of reasons. Number one, it started out that you know I was developing with it years and years ago. But I ended up doing support and supporting different accounts for some time and making architecture recommendations and you know, that's where I got to know about the value, the business value that cold fusion presents. And I think that it gets a lot of flak for being one of the first and I don't think that that's necessarily how you want to look at it, how you should look at it. But I think that it certainly continues to drive business value for a kind of organization. And for me specifically, I think just being in this this most recent position gave me an opportunity to really make some deeper relationships with customers. The larger accounts that we have to understand exactly how they're using and the different use cases. And by doing that, I'm more proud because not only am I able to understand all of the value that it drives, but I'm also able to talk about that. And I think I talked about this at the C.F. objective that you know, it's very difficult for me not to say the names of the customers that are using this. But we've got some massive applications that are being built, that are driving business and really critical business for heavy hitting companies, right. And I think that's where I'm proud to be a part of this whole initiative and I think that cold fusion is certainly not dead and it's growing for us. And it is a technology that I think people need to try it before they go ahead and I put it down for been the first. So, I am proud to be part of that cold fusion initiative. Michael: Well, would you like to come back on the podcast another day and talk about that in more detail? Elishia: Absolutely yeah, I could talk for a while on that subject. I don’t know if you’ve noticed but I've got a lot to say. But I'm trying to hold back a little bit. But I would love to come back and talk a little bit more about that subject, absolutely. Michael: Well, we'd love to have you back on the show for that because we’re here to make cold fusion more alive and that sounds like a great topic of conversation as to why you think it is so alive and all of good things going on in it. So, we’ll do an episode on that in the future. But meanwhile,what would it take to make cold fusion more alive this year in your opinion? Elishia: More alive this year. I think definitely more tendency of the summit, that would help. But also I think that we've been trying to think of different ways that we could engage the community and really provide more training. So, that's something that I've been talking internally a lot about and how we can drive that forward. So, I think we'll hopefully get something out within the next quarter or so to start bringing some of those initiatives to play because I think that what we're missing right now with the product in terms of making more engagement or bring more engagement and bringing more activity is the training and the ability to quickly and easily find the necessary information to deploy and create out. So right now we have a lot of resources that are pulling in interns and training those interns. I think it be great if we provide additional supplemental material to them. And one of the ways that we started doing that is to develop our week next week. Next week, the topics are going to be a little bit more on the advanced side but I think that's a great way for us to keep engaged with the community to provide additional training and resources because all of these are going to be recorded. And you can watch them later on if you wanted to go back and check out that information. But I think training is in the way that we can keep the product moving forward and keep it more alive. Michael: That sounds like a great things to do. So, what are you personally looking forward to at C.F. summit this year? Elishia: Personally, I actually really enjoy going and meeting with everybody that I haven't seen since you know, the last conference or the last C.F. summit. And the reason why is that's where I think I get the most valuable conversations going especially regarding feedback. I think a lot of times, people are less open to putting in a detailed e-mail or might take a long time to put in a detailed email about what they want and what things are bothering them about the product. But when I sit down with them either a coffee or maybe over drinks at the event, then they start letting me know a little bit more about why that is. And I get the chance to really kind of interview them about you know, well how do you think it would you know make sense for us to move forward with that. What kind of things can we do? What are options in providing a solution for that particular problem? So for me, it's about meeting the community again, seeing those familiar faces and really kind of I don't know that everybody has become my friends these days. So I know about their kids and I asked them about them. So it's a really great environment to kind of network with everybody even for me. So, that's what I'm looking forward to most I would say. Michael: Wow, great! So, if people wanted to find you online, what's the best way to do that? Elishia: Well, I think everything is all over the place. But I think probably a quick you know, if you want to quickly touch base on something short certainly Twitter is easy. So, my Twitter handle is elishdvorak. So, you can get me there. The other place is I would say maybe in the blogs. I usually do some posting on the blog and you can certainly email me at my first name@adobe.com too. Michael: Excellent! Well, thanks so much for being on the show Elishia and have a great success with C.F. summit. I think it sounds like an amazing event this year. So, I really appreciate you giving us all the behind the scenes info on it. Elishia: Awesome Michael, thanks for having me. I appreciate it and I hope to see everybody at C.F. summit this year.